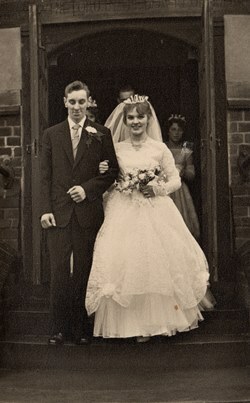 Childhood sweethearts, Sam Ellis born 1939 at Stoneyford and Patricia born 1941 share their many memories. Growing up at Pye Hill and buying groceries at Billy Hughes’ shop. School days at Jacksdale huddling around the big stove in the old tin classroom. Playing games on the street, skipping, cowboys and indians on the Bind Hill and footie on what is now the garden centre field. Winter evenings were spent playing tiddly winks and snakes and ladders with the family, until the ‘box’ arrived a 9 inch Bush TV. Working days, in the Co-Op at Jubilee and later racing up Jacksdale Station steps to catch a train to Langley Mill Co-Op. Working at the Pipeyard and the temperature clocks kept in the old ‘snap’ room, their gauges reading yellow, black, green and red, rising from 900 degrees in the kilns to 1100 degrees. The strict schoolteachers and the lenient gaffer at work, Percy Shardlow, who was a great bloke. just like one of the lads. A lovely mixture of memories.